Iron Leg Radio Show Episode #93 – Christmas Special! What you see before you is a very special, spur of the moment/impromptu edition of the Iron Leg Radio Show! In celebration of the Christmas season, and that I had that Jean Shepherd broadcast waiting to go (and a little time to burn) I descended into the basement studio, right next to the Christmas tree, and let-er rip (thanks to the folks that made the scene live!). This week we pull something from the ‘easy but interesting’ file. Margo Guryan’s ‘Sunday Morning’ is one of those sort of “hidden’ standards of the 1960s, in that it was a wonderful song, covered a bunch of times, yet doesn’t seem to have broken through to the wider consciousness. Among the great versions of the song are those by Spanky and Our Gang, Oliver, and Julie London, among others. The version I bring you today comes from an unusual source, that being Trombones Unlimited. 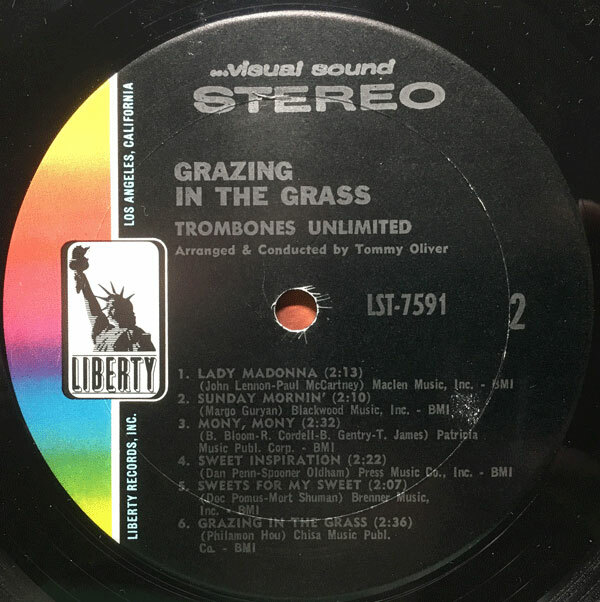 Trombones Unlimited were a studio group out of Southern California that recorded a half dozen albums between 1966 and 1969 for the Liberty label. 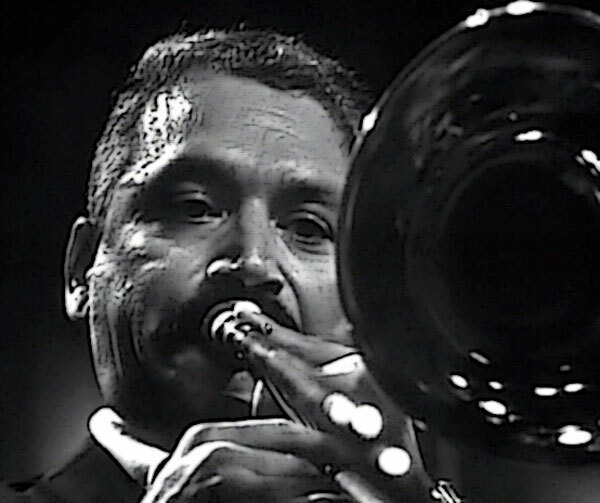 The albums were arranged by Eddie Karam, Tommy Oliver and George Tipton, and some of them featured serious jazz players like Frank Rosolino. 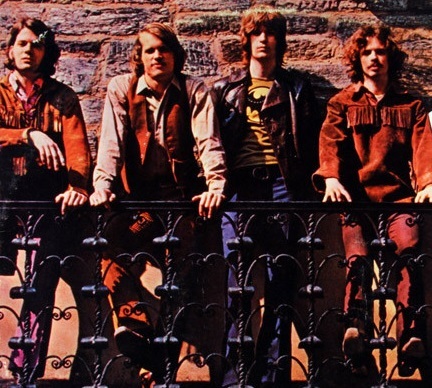 Today’s selection comes from the group’s final album, 1969’s ‘Grazing In the Grass’ where it was alongside covers of tunes by Aretha Franlin, Sam and Dave, Tommy James and the Shondells and Hugh Masekela. This is not to suggest that the end result was in any way soulful, which it wasn’t. My guess is that the sounds were supposed to appeal to ‘beautiful music’ stations and the cover info was supposed to reel in unsuspecting kids and hi-fi hipsters. The cool thing is, Guryan’s melody is so wonderful that it manages to survive the buttery treatment it gets here. These albums, like many similar instrumental efforts pumped out by Liberty, Imperial and so many other labels in the 60s, are cheap, and worth picking up if you are a cover version junky like myself. I hope you dig it and I’ll see you all next week. Welcome to the new week here on the Leg of Iron. 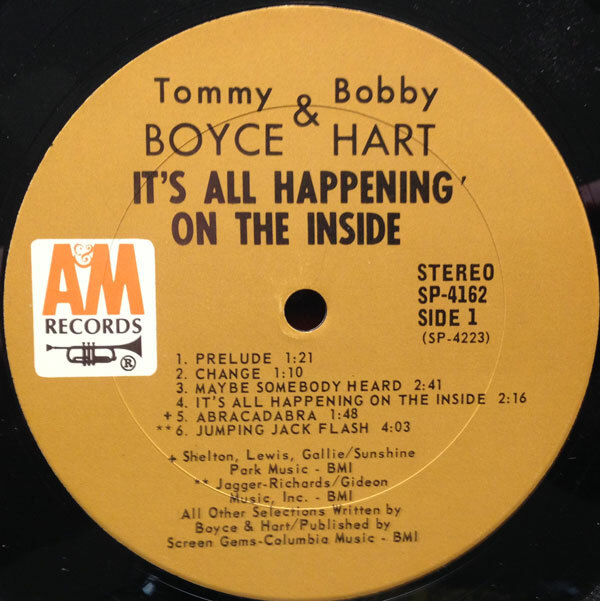 The trio of late 60s albums by Tommy Boyce and Bobby Hart are favorites of mine, mainly because outside of their hits, the material is little known, and by and large quite good. 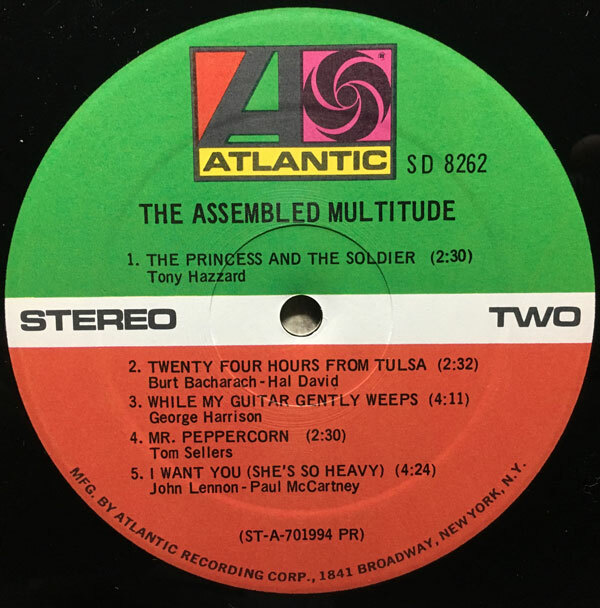 The last of their albums, 1968’s ‘It’s All Happening On the Inside’ was, sadly, hit—free, yet contains a number of excellent tracks. As I was discussing with a friend recently, outside of their big chart hits, like ‘I Wonder What She’s Doing Tonight’ and ‘Alice Long’, Boyce and Hart’s studio creations tended to be a lot more interesting, progressive and sometimes experimental. The track I bring you today is unusual because it is neither a Boyce and Hart composition, nor is it an outside cover. ‘Abracadabra’ was written by the members of Boyce and Hart’s band, LA studio heads Louie Shelton, Billy Lewis and John Gallie. The song is a slow moving tune, with acoustic guitar filagree weaving in and out of the grinding riff, eventually replaced by electric guitar soloing. 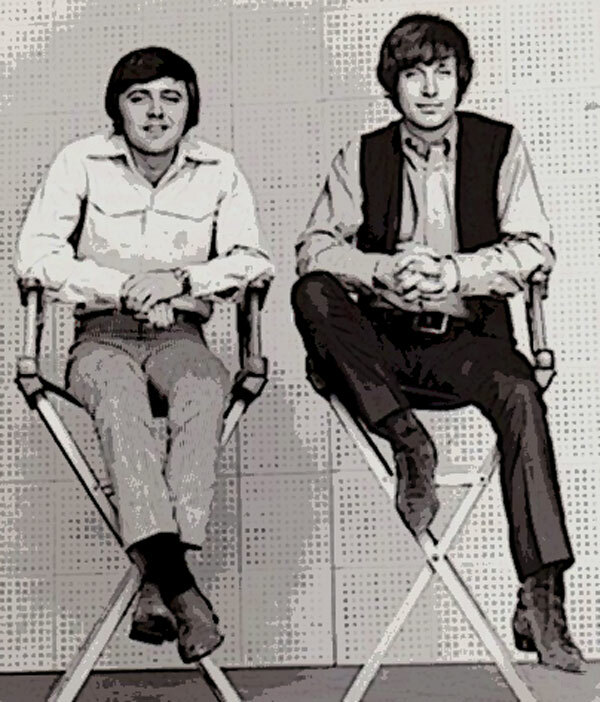 While it definitely sounds like 1968, I think most people would be very surprised indeed to find out that it originated on a Boyce and Hart LP. It is a relatively short track, clocking in at just 1:48, and ending abruptly, but it has a nice groove and I dig it. This month we continue to dig back into the wave of 2017/2018 new arrivals, with the Herd, California, Uncle Sound, Keef James, 31st Of February, George Washington Brown, Steve Douglas, the Zombies and the King Bees! Dig – if you will – the latest episode of Testify! my weekly show for WFMU’s Give the Drummer Radio. I know that I’ve been re-posting here for a while, but I think you folks would dig it a lot if you gave it a listen. …a throwback to the late-night free-form FM radio I grew up with in the early to mid-’70s. The silence of the night taken in unexpected directions, with plenty of head space for sussing out what it all means, or what it might mean. I hope you dig it, subscribe to the show as a podcast, and drop something in the old Patreon bucket. This is a very special, very groovy episode of the show that I think has a lot to offer for Iron Leggers.